Lustrous peacock pearl, black onyx, and sterling silver bar necklace. 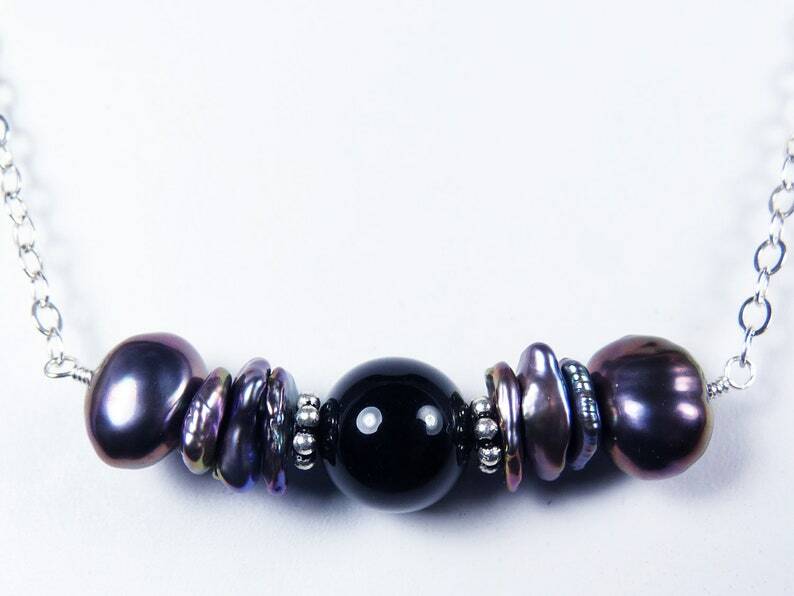 A smooth black onyx bead is flanked by sterling silver beads, peacock keishi pearls in shades of gray, silver, purple, and lavender, and large dark gray pearls with purple highlights. These lustrous, genuine, high quality, freshwater pearls glow with beautiful colors. Now with FREE shipping for U.S. orders and lower priced shipping elsewhere! The black onyx bead is 10mm, and the gemstone, pearl, and silver bar pendant is approximately 41mm (1 5/8") wide. The gems are wrapped with sterling silver wire, and they are attached to sterling silver chain that fastens securely with a large sterling silver lobster claw clasp. The necklace in the photographs is 18" long. This pearl and gemstone necklace is sophisticated and elegant! All RazzleBedazzle necklaces and earrings are packaged in gift boxes, perfect for gift giving.